Blood On The Streets ! It sounds very dramatic, but what are the origins of this and what's it got to do with house prices ?? And has anyone seen any actual blood on their street recently ? Rothschild I think... made his fortune around the time when news spread across Europe that Napoleon had escaped his prison and had landed in France again. The news of Napoleon marching on Paris not only sent shockwaves through France but throughout the whole of Europe. This resulted in an economic crisis and Rothschild gambled that Napoleon would not last long. He was right. Odd really, as the saying is something that I would personally think of being linked with about 20 years earlier, just before Napoleion came to power, when there was blood on the streets during the French Revoultion. You would think the phrase had been said countless times before - sort of thing you can imagine them saying in Ancient Rome. Here you go - actually goes from Rothschild to Buffett so it is HPC related. 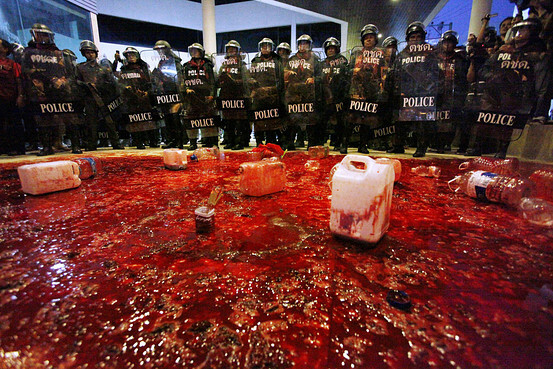 The Bangkok Police Department were overjoyed to hear they'd broken the world record for making the world's largest pizza. Always thought that Ban C0ck was a an oxymoron for that place. Nevermind Bangkok, look at General Congreve's avatar!